Digital Asia Hub and the United Nations University Institute on Computing and Society (UNU-CS) co-hosted a team from the Center for Internet and Society(CIS), Bangalore, on February 23, 2017 at JMSC, HKU, to share insights from their Pervasive Technologies Project. 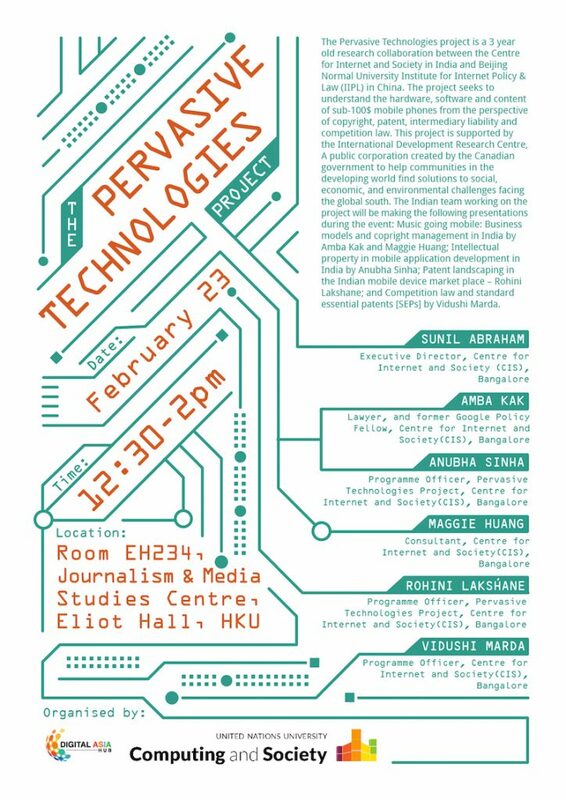 The Pervasive Technologies project is a 3 year old research collaboration between the Centre for Internet and Society in India and Beijing Normal University Institute for Internet Policy & Law (IIPL) in China. The project seeks to understand the hardware, software and content of sub-100$ mobile phones from the perspective of copyright, patent, intermediary liability and competition law. Competition law and standard essential patents [SEPs] by Vidushi Marda. This event was the first of a new networking initiative between Digital Asia Hub and UNU-CS aimed at fostering engagement and knowledge sharing at the intersection of technology, society, law, policy and international development. To stay informed of upcoming events subscribe to our newsletter. This entry was posted in DAH-UNU Series, Events and tagged UNU. Bookmark the permalink.